It's not always the case, but I would say that more often than not it pays off to be original. As far as low-budget productions go, this one is actually pretty decent, which is mostly due to an original premise and approach to things. It's certainly an unique movie, both the look at and follow. It's a visually appealing movie, with some good effects and a decent look to it, while it's story provides the movie with plenty of original and interesting angles. 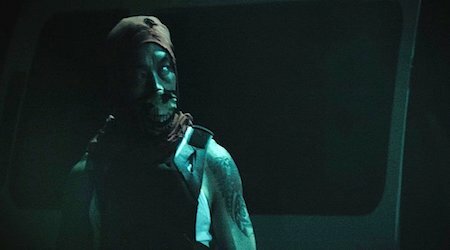 Like I said, the movie is pretty unique, but in a way it still reminded me of a fantasy and more classic horror version of a "Saw" movie, in which a group of people try to escape from a hospital, after mysteriously waking up there. It's hard to categorize this movie, which in this case is a good thing. It's an interesting blend of fantasy, science-fiction and horror elements that really speaks to the imagination. Sure, it can get a bit confusing at parts, but overall it remains a pretty cool and interesting watch, with also plenty of surprises in it. It's true that the movie still can be mostly seen as a horror flick though. Fans of the genre are probably going to end up being decided about this movie. It by no means is a standard horror movie involving scares and a standard dark atmosphere and build up, which is probably going to scare off (no pun intended) horror lovers, while others are going to end up really liking the original approach of the movie. And really, there still is plenty of gore and crazy looking monsters in it to please most fans of the genre. The movie does a pretty good job setting up its tension and mystery. It helps to keep the movie interesting to watch at all times, even when it's being a bit slow or vague. I really admire the movie for its concept and execution, though it's still far from flawless (after all, it's still a low-budget production) and not everybody is going to end up liking this movie. But that's no complaint really.